Dransfield, Scott. 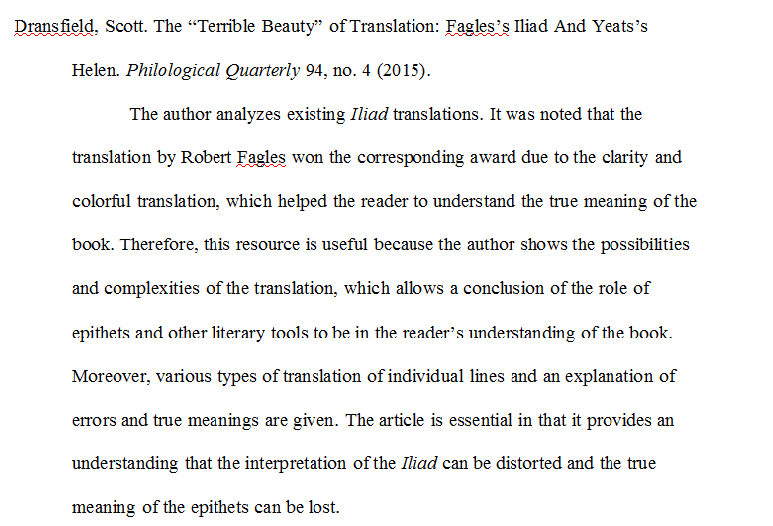 The “Terrible Beauty” of Translation: Fagles’s Iliad And Yeats’s Helen. Philological Quarterly 94, no. 4 (2015). The author analyzes existing Iliad translations. It was noted that the translation by Robert Fagles won the corresponding award due to the clarity and colorful translation, which helped the reader to understand the true meaning of the book. Therefore, this resource is useful because the author shows the possibilities and complexities of the translation, which allows a conclusion of the role of epithets and other literary tools to be in the reader’s understanding of the book. Moreover, various types of translation of individual lines and an explanation of errors and true meanings are given. The article is essential in that it provides an understanding that the interpretation of the Iliad can be distorted and the true meaning of the epithets can be lost. King, Katherine C. Ancient Epic. Reprint, Chichester, West Sussex, UK: Wiley- Blackwell, 2012. The author makes an introduction to critical poems of ancient literature, including the Iliad by Homer. It is worth noting that King conducted an in-depth analysis of each poem and highlighted the contexts in which they were written. This book is essential for this study since a clear understanding of the conditions that influenced the writing of the Iliad helps to establish the role of epithets and other artistic devices in the poem. Lament, Claudia. The Transformation of Achilles in the Iliad: A Reading from the Views of Sibling Narratives and Nonlinear Growth. The Psychoanalytical Study of the Child, 68 (2014). The author analyzes one of the main characters of the poem of Achilles. An essential aspect of the article is the cultural and social perception of Achilles, as well as the identification of the actual character traits and the image of this hero. Therefore, the article is useful in that it allows one to compare the epithets and the image of Achilles to analyze the message that Homer wanted to convey, as well as the appropriateness of these literary tools. Mackie, C. J. Zeus and Mount Ida in Homer’s Iliad. Antichthon, 48 (2014). This article talks about the role that Mount Ida and Zeus played in the book. It should be noted that these objects were one of the keys to the plot and contributed to the subsequent episodes. Consequently, the author provides the basis for an analysis of the epithets in Iliad, since it highlights the significance of specific objects and Homer’s relation to them. This approach is logical since the study of epithets is impossible without background knowledge of the subject. This resource is useful primarily to build an understanding of the main story lines, and the role played by principal characters and objects. Mason, Henry. Homer and the Homeric Hymns: Mythology for Reading and Composition. Style 47, no. 4 (2013). The author of this article concludes that Homer’s poems can be incomprehensible to ordinary people. Therefore, the resource provides explanations for many episodes of the Iliad and other works that can be misunderstood. The importance of this article for the current study is that epithets are an essential part of the Iliad, and therefore a correct perception of the plot will allow an objective assessment of their role. Nagy, Gregory. Homer the Preclassic. Reprint, Berkeley: University of California Press, 2012. The book is an analysis and critical evaluation of Homer’s poems, including the Iliad. It was noted that the study of the literary creations of the author in chronological order allows one to notice an individual development and change in artistic techniques. Moreover, the author takes into account the linguistic errors of translation, which can affect the perception of poems by the reader. Therefore, this resource is essential in that it allows one to understand the role of epithets in Homer’s work and trace the change in the literary style of the poet. Ostwald, Martin. Language and History in Ancient Greek Culture. Reprint, Philadelphia: University of Pennsylvania Press, Inc, 2011. The book is a description of Ancient Greek society and the factors that influenced its development and change. The author took into account the political, cultural, social, economic, and other aspects of culture at that time in order to make an objective picture for the reader. The resource is essential in that it allows one to assess the influence of secondary factors on literature, including Homer’s work. As a result, it becomes possible to understand the role of using epithets in the Iliad. Roisman, Joseph, and J. C. Yardley. Ancient Greece from Homer to Alexander: The Evidence. Reprint, Malden, MA: Wiley-Blackwell, 2011. Rynearson, Nicholas C. Helen, Achilles and the Psuchê: Superlative Beauty and Value in the Iliad. Intertexts 17, no. 1-2 (2013). The author of this article analyzes the main characters of the Iliad, as well as critically assesses the image of the characters in accordance with the epithets, metaphors, and other literary techniques that Homer used. Moreover, many episodes of the poem were deeply analyzed in order to understand the true meaning, which is not noticeable at first sight. This article allows one to conclude the actual images of the characters and episodes, as well as the use of the appropriate epithets in the Iliad. Sammons, Benjamin. The Art and Rhetoric of the Homeric Catalogue. Reprint, New York: Oxford University Press, 2010. The author analyzes the entire literary activity of Homer. For example, an assessment of literary techniques and the manner of speech of the ancient Greek poet is given. In turn, the analysis of Homer’s activities makes it possible to understand the reasons for using epithets. Consequently, the review of the evaluation of the role of epithets in the Iliad depends on the whole activity of the poet and the reasons for this literary style. Therefore, this book is useful in that it provides a basis for further research on character epithets in the Iliad.